Of all the genres cinema has to offer, it’s hard to think of one more influential or compelling than noir. Unlike evergreen genres like comedy or science fiction, noir’s popularity is seasonal– it ebbs and flows very similar to how westerns periodically rise and fall into fashion. In a way, film noir could be seen as the anti-western; countering the latter’s sunkissed open landscapes and virtuous heroes with cramped urban environments, pervasive shadow, and compromised morals. Noir has become so ubiquitous in both cinema and larger pop culture that we easily recognize it’s tropes and hallmarks, to the point where we feel like the idea of femme fatales and fedora-brimmed private investigators is as old as modern society itself. For a genre that trades heavily in dramatic irony, it’s perhaps fitting that director Billy Wilder – one of cinema’s most-respected comedic voices– would serve as the chief architect. It’s interesting to watch Wilder’s third American feature DOUBLE INDEMNITY (1944) now because, on first glance, the film seems so steeped in noir cliches that it’s almost laughable. It’s easy to forget that, in the context of over seventy years of noir cinema, DOUBLE INDEMNITY was actually a pioneering work in the genre– the first to use and establish these all-too-familiar stylistic conceits and imagery. The film is regarded as one of the earliest instances of a mainstream Hollywood film exploring the opportunity and motive for committing cold-blooded murder, and Wilder and company’s unflinching embrace of the material arguably popularized the idea of a film using its controversy as a major selling point. Based on the James M. Cain novel of the same name, DOUBLE INDEMNITY had long languished in development purgatory, placed there by the restrictive Hays Code and generally regarded as “unfilmable” due to its salacious, amoral storyline. Wilder, however, saw the property as his opportunity to break out from conventionally-anonymous mainstream filmmaking and make a name for himself. There was just one problem: his writing partner, Charles Brackett, refused to help him writeDOUBLE INDEMNITY out of his utter distaste for the material. 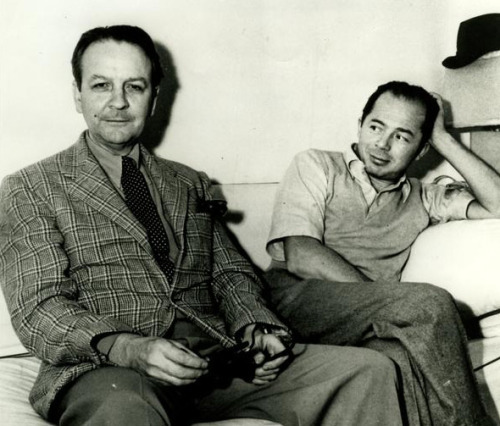 Wilder decided to press ahead anyway, securing the services of a new writing partner in the form of legendary crime novelist Raymond Chandler. Their collaboration was infamously contentious, with the mischievous Wilder’s various antagonisms reportedly driving the ex-alcoholic Chandler back to the bottle. Despite this backroom drama, Wilder and Chandler emerged with a devilishly well-written script and a firm foundation upon which Wilder would build his first directorial masterpiece. DOUBLE INDEMNITY, set in Los Angeles in 1938, tells the story of Walter Neff (Fred MacMurray)– a slick, successful insurance salesman who knows the ins and outs of his business better than anybody. We first meet him as he sneaks into his office late one night, bleeding profusely from a bullet wound as he records a confession into his boss’ dictaphone. We then flash back a few days earlier to the cause of the trouble: Neff’s house call to the Dietrichson residence up in the hills of Los Feliz. He’s there to convince Mr. Dietrichson to renew his auto insurance policy, but instead he’s received by his client’s wife, Phyllis Dietrichson (Barbara Stanwyck). After their first, dangerously flirtatious encounter, Neff finds himself drawn back to the house and ultimately into Phyllis’ arms. Phyllis gradually divulges her unhappiness with her current marital situation and her attraction towards him, expressing a forbidden interest in doing away with her husband once and for all. Neff – not really of virtuous intent himself– eagerly proposes an elaborate murder scenario that would not only allow them to finally be together, but to also net a hefty payday for their trouble in the form of an insurance payout under the auspices of an “accidental death”. As Neff and Phyllis put their nefarious plan into action, they find that the act of killing is easy enough, but the act of getting away with it is an altogether different challenge, fraught with peril, paranoia, and betrayal. With the benefit of hindsight, we can see DOUBLE INDEMNITY as it truly is: a masterfully riveting crime drama that profoundly influenced mainstream filmmaking and opened the floodgates to wave after wave of morally-ambiguous antiheroes and deceptive femme fatales. Foresight, however, is much less certain by nature, and as such, DOUBLE INDEMNITY’s pulpy story and corrupt characters provided quite the challenge when it came to Wilder attracting highly-respected talent to his cast. After a long search for the right person to play the duplicitously debonaire insurance hack Walter Neff, Wilder found his man in Fred MacMurray. One of Hollywood’s highest-paid actors at the time, MacMurray was primarily known for broad comedies, and his appearance in DOUBLE INDEMNITY marked a rare dramatic turn that would profoundly influence the direction of his career. His inoffensive, milquetoast handsomeness provides the perfect facade for the corruption lurking underneath– made all the more disturbing with its implication that even the most civilized, upstanding member of society carries with him the capacity for unspeakable evil. His co-star, Barbara Stanwyck, was also one of the highest-paid actresses in the business, and her arresting performance as the seductive and conniving housewife Phyllis Dietrichson would ultimately earn her an Oscar nomination for Best Actress as well as an enviable distinction as the first true “femme fatale”. Edward G. Robinson, a well-known star of Depression-era gangster pictures, plays the supporting role of Neff’s boss, Barton Keyes. Keyes is a fast-talking, cigar-chomping wiseguy excessively educated in the various methods one could use to kill themselves (and the accompanying success rate). Though he may be short, Robinson stands tall as a shining beacon of morality and principled decency amidst a sea of corrupt, indulgent narcissists. Finally DOUBLE INDEMNITY boasts the only appearance of notoriously-reclusive writer Raymond Chandler ever committed to film, in the form of a small cameo. DOUBLE INDEMNITY isn’t just a showcase for Wilder’s stylistic growth– it’s the gold standard to which all subsequent noir films would aspire. Shot on black and white 35mm film in the square 1.37:1 aspect ratio by Wilder’s frequent cinematographer John Seitz, DOUBLE INDEMNITY’s striking compositions and low-key lighting setups would establish the style guide for this new genre while simultaneously harkening back to the older visual styles of Wilder’s youth, like German Expressionism. One of the film’s innovations is the recurring motif of light streaming in through venetian blinds, casting shadows that resemble prison bars onto the characters. This technique has been widely copied through the decades, with its contemporary use by style-minded directors like Ridley or Tony Scott proving its enduring appeal. Wilder’s actor-centric approach to directing had– to this point– resulted in fairly unremarkable wide compositions and 2-shots with spare coverage and movement. FIVE GRAVES TO CAIRO (1943) saw Wilder’s first experiments with stylized cinematography, and DOUBLE INDEMNITY provides him with the opportunity to further explore his abilities in the arena. Editor Doane Harrison’s influence on Wilder is still palpable in a minimalistic, in-camera coverage approach that supplements wide masters with strategic closeups. However, Wilder puts a lurid twist on an otherwise-pedestrian coverage by letting his closeups go on just a little too long, giving the impression that the characters are leering rather than gazing. We also are beginning to see Wilder using his wider master shots as an opportunity to play with depth, consciously making artistic juxtapositions between elements in the foreground and the background (and often placing them both in focus). Wilder’s reserved approach to camera movement gives the film a great deal of energy and momentum, albeit in a counterintuitive way– whereas many directors like to show off their stylistic flair by enlisting virtuoso camera movement, Wilder simply matches the motion of his camera with the motion of his subjects. His emphasis on function over flash makes for a muscularly minimalistic presentation that pulls us deeper into his story by removing extraneous technical distractions. Wilder proves that even the absence of crucial information can be just as effective as its inclusion, as evidenced by the central murder sequence being made all the more affecting by Wilder choosing to dwell on a closeup of Stanwyck’s smiling face instead of actually showing us the murder in progress. The film’s shadowy chiaroscuro is complemented by returning composer Miklos Rozsa’s brassy and intrigue-laden score– itself a source of controversy during the film’s making. The music may sound to us now as inoffensive and quaint in an “old-fashioned Hollywood noir” sort of way, but it apparently ruffled enough feathers to be considered bold and transgressive by the studio establishment upon first hearing it. 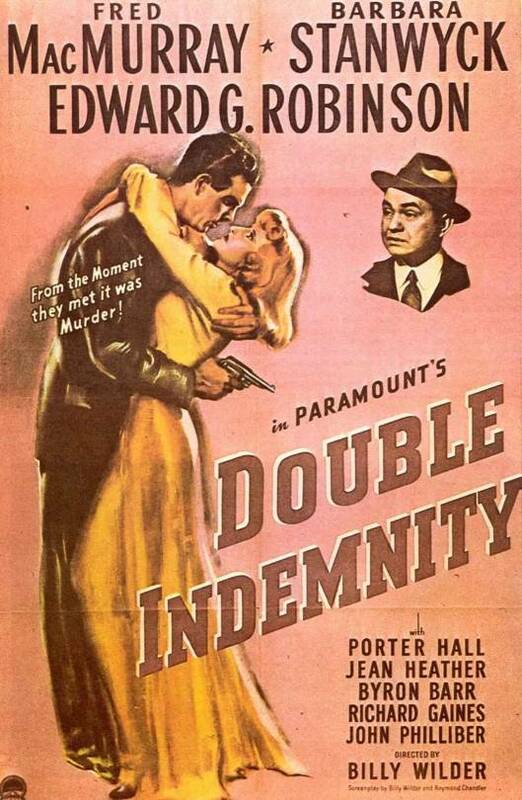 An unflinching meditation on vanity, adultery, and murder, DOUBLE INDEMNITY’s vice-laden narrative certainly had its work cut out for it in regards to evading complete and total evisceration by the censors. A light, winking touch was required to make the material palatable and morally acceptable to the MPAA’s professional pearl clutchers. Wilder was in a prime position to walk that line, having cultivated over his previous works a playful approach to off-color content designed to cleverly fly under the censors’ radar. The opportunity to break new dramatic ground while seeing how much depravity he could get away with wasn’t the only appeal that DOUBLE INDEMNITY’s story held for Wilder– it also allowed him to indulge in his fascination with class systems. Whereas THE MAJOR AND THE MINOR found comedy and romance in the divide between the rich and the poor, or FIVE GRAVES TO CAIRO threw two very different service cultures into conflict,DOUBLE INDEMNITY aims squarely down the center in its exploration of the modern American middle class that was just beginning to emerge from post-war economic prosperity. His convictions about this ascendant social group are reflected here in images that he’d later employ to much more direct effect in 1960’s THE APARTMENT– the idea of a suit as an identity-depriving uniform, endless rows of desks manned by faceless white-collar worker bees, the cramped luxury of a well-appointed bachelor pad, or even the canned domesticity of a grocery store….it’s rows and rows of identical products implying the neutered complacency of abundance. Wilder’s insightful perception of the American middle class, seen in its earliest incarnation here, aided him throughout his career in creating some of the most effectively artful and enduring reflections of mid-century society ever committed to celluloid. DOUBLE INDEMNITY is currently available on high definition Blu Ray via Universal. – Via Wikipedia: “Shadows of Suspense”.Double Indemnity Universal Legacy Series DVD (Universal Studios). 2006.